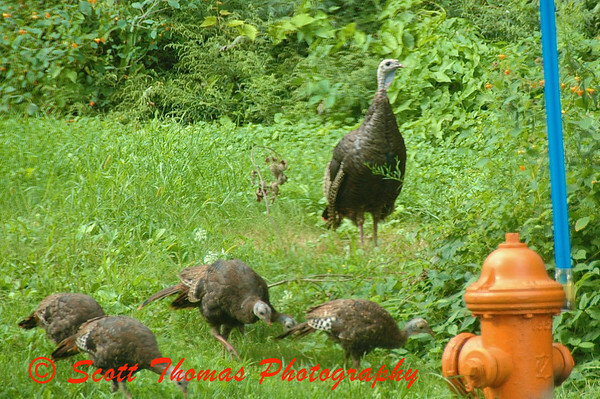 Wild Turkey hen herding a group of poults (as young turkeys are called) outside my home. 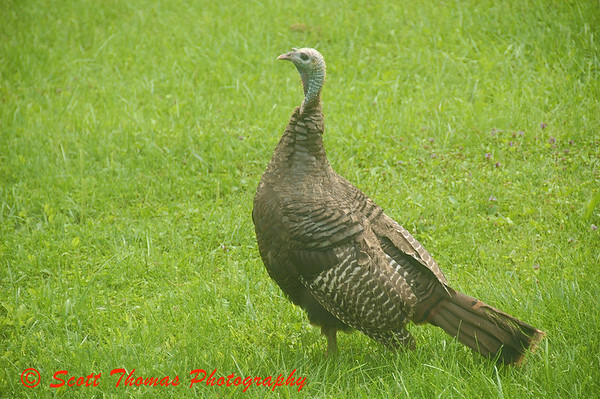 My blog buddy, Bob of rveWong’s Weblog, had a recent visit of wild turkeys. At the time, I had seen a large group but did not have my camera handy. I enjoyed watching them and hoped I would see them again. Early last Saturday morning my daughter alerted me to the fact the turkeys were back. Since I had been preparing for the wedding I would be shooting later, I had my camera ready this time. Not great photos as I was shooting through glass and the turkeys did not get as close as Bob’s. The third hen of the group was the last to walk by my house and was a bit uneasy. The reason for the hens uneasiness. Our newest family member, Gus the cat, was eyeing her from a window ledge. 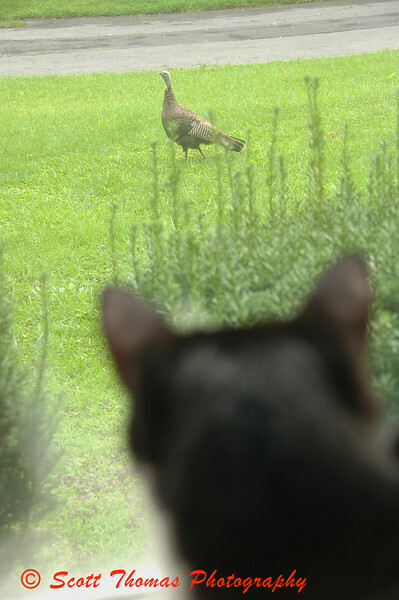 This entry was posted in Animals and tagged cat, Photography, urban, wild turkey, wildlife. Bookmark the permalink. It’s amazing how similar your turkey visit is to mine. I didn’t have them pecking at my glass door like you did, Bob. I saw them again over the weekend so they are still hanging around. LOL! Miss Puss is quite taken with our turkeys, too. They are difficult to capture, as they move a lot faster than you think they do, flowing over the drumlin and into the woods before you can get them in focus. Ah well. These are very nice. Must go look at Rvewong’s. My house was acting as a blind. Still, had to careful not to spook them. That’s the first time Gus has stayed still long enough for a photo. I got others but this one showed what he was looking at and the turkey’s reaction to him. Turkeys in the wild are very hard to get close to. You have to use blinds and/or dress from head to toe in camouflage material. By coincidence we have had turkeys in our yard the last few days too. My photos weren’t as good as yours though. Sure is nice to have them around! Isn’t it funny? I never knew we had turkeys in our area until a couple of years ago when they started showing up in my yard from time to time. Great shots. I’m sure Robyn (Mitch’s wife) was very surprised at the amount of wildlife around your neighborhood. The more people keep building homes and sucking up habitat, the more wildlife will adjust to living amoung them. Hopefully, turkeys won’t become a nusance like Canadian Geese have become in some places.